How-To Projects & Tips | Do-It-Yourself Advice Blog. If you enjoy striking “before and after” photos of makeovers, this post is for you. One of our managers, Brian, recently purchased a total fixer-upper powerboat and, together with the Sailrite team, he completely transformed it into a great looking vessel for himself and his family. Take a look at this stunning makeover. When we started, this 1982 Regal 245 XL Ambassador was looking pretty dated with its brown vinyl on the bridge deck. The inside was worse, with musty carpeting and cushions as well as a furry headliner that was beginning to fall down from the ceiling. All of the cockpit upholstery was replaced using Morbern’s Seabrook Vinyl in a brighter color combination that utilizes three different fabrics for decorative effect. We also reupholstered side panels in the cockpit and added Infinity Luxury Woven Vinyl Flooring. In the cabin, all the headliner was removed and replaced, the cushions in the v-berth was redone and curtains were added on the windows using Geobella fabrics. We even made a decorative hull liner panel for the aft cabin that mimics the design on the cockpit cushions. All of these project videos will be released in our brand new How-To Projects & Guides section of the Sailrite website. You can click on 2016 Project Powerboat in the left-hand navigation to filter down to all the videos from this series. Are any of these projects on your to-do list? What kinds of powerboat projects would you like to see? Share your feedback with us in the comments. With summer right around the corner, it’s time to pull your patio furniture out of storage and get your outdoor living space ready for the season. If your old patio furniture is leaving you feeling uninspired, why not sew up a new project or two to give the furniture and patio space a new look? You could sew new cushions, change the throw pillows, add outdoor drapery or re-do old sling chairs for a brand new look this summer. To help get you inspired for new patio projects, we’ve compiled three different looks using Sailrite fabrics that can use on your own patio. Each design features all outdoor living fabrics, so everything is appropriate for occasional outdoor use. Let’s start things off with a bang! Your outdoor living spaces are great places to take design risks. If you love bold colors but aren’t sure about them inside your home, try them outside! Your patio is a great place to play with not only color but also bold, graphic patterns like latticework, abstract geometrics, and large-scale floral. This look features a statement fabric, a punchy floral but is also toned down with a solid beige. The bright blue unites all the fabrics to keep the look cohesive. We also included a sling fabric, to show how sling chairs can work with softer pieces in the same space. Black and white is a timeless color pairing that will always look stylish. For this look we started with a base of black and white fabrics (think for cushions and larger pieces) and then we added a pop of color by bringing in the greens of this tropical palm leaf fabric. You could use any accent color with black and white—you could even pick a fabric to match the flowers, plants or landscaping around your patio. Black and white make for a great base for creativity! Make your outdoor living space a relaxing retreat with cool, calm colors as seen in this sophisticated and understated look. The soft blues bring in color without being too loud and the greys and beiges really anchor this color scheme. You could mix and match these fabrics in many different ways around you patio, using a solid or one of the patterns as the main cushions with pillows in the others. Give your pillows a little extra pizzazz with a Sunbrella piping or fringe, which are durable enough to be used outdoors. Which of these designs suit your style, or would you do something completely different? Share your opinions & ideas with us in the comments! Shop for even more outdoor living fabrics in a wide range of colors and styles at Sailrite.com. Are you redoing your boat cabin and not your patio? Check out our roundup of 3 Boat Cabin Design Ideas! Adding a decorative flange or ruffle to the edge of your pillows is a fun way to mix up the look. These little pillows would be perfect for a living room, bedroom or even outside on your patio. They are a quick and easy DIY project that you can do in just a day to add a little bit of color wherever you need it in your home. Over the last couple weeks we’ve been sharing several projects for the same patio, we recovered bullnose chair cushions, made lumbar pillows and sewed up a bench cushion. Today is the final finishing touch and we’ve made these flanged pillows for a set of sling chairs to keep the colors flowing all around the patio. We’re using a Waverly Sun N Shade fabric, Santa Maria Mimosa for these pillows, just like we did for the lumbar pillows. 1. If using a fabric with a pattern, determine which part of the design you’d like featured in the center of the pillow, if any. Mark the center of this design for patterning reference. 2. Pattern your fabric using the same dimensions as your pillow form. Our form was 18” x 18” so we traced out an 18” x 18” square on the fabric. 3. Cut out your first square and use it to pattern the second panel. 4. Lay your two panels on top of each other with the right sides facing each other so the pattern lines up symmetrically. 5. To make the corners of your pillow fuller, trim a little fabric from each corner. At one corner of your fabric panels, measure down 4” and make a mark. From the corner again, measure over 1/2”. At an angle, draw a line connecting the two marks. Do this for both sides of the corner, then cut along that line. Repeat the process on the opposite corner. 6. Fold over the fabric and use it as a guide to trim the two remaining corners. 7. Pin your two fabric panels together. Take them to your sewing machine and sew around the perimeter of three sides of the pillow. Leave an opening at the bottom of the pillow big enough to insert your pillow form. 8. Trim the excess fabric from each corner. 9. Turn your pillow cover outside right. 10. Carefully work each edge at the seam so it lies as flat as possible. 11. Pin the seams flat and the pieces together around the perimeter of the pillow cover. Take your fabric to the sewing machine and sew 1/2” in from the outer edge of the fabric on three sides. This will create a 1/2” lip around the pillow. 12. Carefully insert your pillow form. 13. Fold under the raw edges on the pillow’s opening and pin a 1/2” in from the folded edge to create the lip along the bottom of the pillow. 14. Using your sewing machine, carefully sew the opening closed. 15. Enjoy your new pillow! You can find all the materials needed to make your own throw pillows from pillow forms to decorative fabrics at Sailrite.com. A bench cushion is a great way to bring color and comfort to your home plus it adds softness to hard seats. We’ve shared how to make a simple bench cushion before that didn’t have any boxing. In today’s tutorial, we’re going to share how to make a bench cushion with boxing on the side. These box cushions aren’t too complicated to sew and are great for mudroom benches, window seats, banquettes and more. For this tutorial, we’re making a cushion to fit on the top of an outdoor storage box. This box keeps patio cushions and pillows out of the elements when not in use and by adding a cushion to the top, it will now be able to be double as a bench for extra patio seating. We’re patterning our cushion off the dimensions of the box top. Since our cushion will be outside we chose a P/Kaufmann Outdoor fabric with a playful, small-scale pattern, Little Hipster Poolside. However any outdoor living fabric would be great for this application. 1. Measure the bench you’re creating a cushion for. Write down those measurements. Then add 1/2” to each measurement. This will be your cut size for your fabric panels. Measure this out on your fabric and cut out your first panel. 2. Use the panel you just cut to pattern your second panel. 3. Next you’ll need to cut out the boxing. The boxing will need to wrap around your cushion on 3 sides (because the zipper will be in the back). Your boxing height should be equal to the height of your foam plus 1/2”. For the width add the measurement across the front, and the two sides, plus 8 inches. The extra 8 inches will let the boxing wrap around the back corners to meet the zipper plaque. Pattern and cut out your strips. If your boxing needs to be sewn together to have enough width to wrap around the whole cushion, cut one of your strips in half. Then sew the short ends of that divided boxing strip to either side of the full width strip. This will evenly distribute the seams on either side of the cushion so neither seam will fall in the front. 4. Cut your zipper tape so that it’s 2” shorter than your cushion width. 5. Since the fabric we’re using is a little thin, we’re going to double it to add strength to our zipper plaque. To do this, cut out your zipper plaque fabric with a length equal to that of your zipper and a height twice the size of your other boxing. Cut two fabric strips of that size. If you’re fabric is thick enough, cut your zipper plaque to the length of the zipper and a height equal to the height of your boxing plus 1”. 6. To double your fabric, press or pin your boxing strip in half. If your fabric doesn’t need to be doubled, press or pin your boxing fabric down 1”. 7. Pin the boxing on one side of the zipper so the folded side is half way across the zipper teeth. 8. Using a zipper foot on your sewing machine, sew one side of the zipper plaque to the zipper. 9. Pin the opposite side of the zipper plaque in place on the zipper flange and sew it down as well. 10. Make bias piping. Follow our How to Make Bias Piping video for this step. 11. Sew the piping to the right side of both your cushion plates (top and bottom). Start at the middle of one long side of the plate so your piping can join in the back of the cushion. 12. To join the piping, let the piping overlap itself by a few inches, and then cut off the excess piping. Use scissors to open the stitching in the piping cover on the free end to expose the cord. 13. Lay the exposed cord next to the sewn piping and cut the exposed cord so it lines up exactly with the other end of the piping. Fold the remaining fabric at an angle and then lay the sewn end so the cords are meeting. 14. Fold the angled fabric over to create a clean piping junction and sew in place. 15. Take a small piece of scrap fabric and fold it in half to create a small zipper stop. Pin in place. Do this for both sides of the zipper. Be sure your zipper slider is installed before adding your stops. Then sew the zipper plaque to the boxing on each side. 16. Find the center location of each side on one of the cushion plates. Match up those centers with the proper places on the boxing and pin in place. You’ll likely have extra boxing fabric at the back of the cushion. Create a fold so the excess fabric is under the zipper and pin in place. 18. Sew the boxing to one of the plates. 19. Repeat the process with the second plate. 20. Unzip your zipper and turn your cushion cover right side out. 21. If needed cut your foam down to size. Our foam was a little too big, so we traced out the measurements we needed on the foam with a Sharpie and then used an electric kitchen knife to cut the foam to size. 22. Stuff your foam into your cushion cover. Make sure to push out the corners so they are well filled out. If you want, you can even add a little stuffing to the corners to give them more of a rounded look. 23. Zip up your zipper and you’re done! Everything you need to sew your own outdoor bench cushion from foam to fabric is available at Sailrite.com. Do you have an outdoor bench that could use a cushion like this? Have you made a project like this before? Share your ideas and experiences in the comments! Lumbar pillows are great for supporting your back in a deep or uncomfortable chair or they can be used for purely decorative purposes to add another color or shape to a pillow arrangement on a bed. Whatever you need a lumbar pillow for, the process of making one is the same and we’re going to walk you through it today. We are making these lumbar pillows to go with the bullnose patio cushions we made a couple of weeks ago. The existing brown lumbar pillows weren’t in bad shape, but they no longer coordinated with our new teal seat cushions, so we use the old pillows for patterning and then borrowed their stuffing. Since our pillows are going to be outdoors, we’re using a Waverly Sun N Shade fabric, Santa Maria Mimosa. This fabric features 500 hour UV protection and up to 1500 hours of light fastness, which makes it a great choice for patio pillows. 1. Determine the dimensions of your pillow. 2. Transfer those measurements to your fabric. We wanted our pillow’s panels to be the same on both sides and we wanted the main flower of the fabric’s pattern to be centered, so we patterned our dimensions around the focal point on the pattern. 3. Cut out your panels. 4. Lay your panels on top of each other with the right sides facing so that the patterns line up symmetrically. 5. To make the pillows corners of the pillow fuller, we trimmed a little fabric off the corners. At one corner of your fabric panels, measure down 4” and make a mark. From the corner again, measure over 1/2”. At an angle, draw a line connecting the two marks. Then cut along that line. Do this for both sides of the corner. Then repeat the process on the opposite corner. 7. Make bias cut piping to accent the edges of your pillow. Follow our bias piping tutorial for this step. 8. Starting at the bottom center on one of your pillow panels, pin the finished piping to the right side of the fabric around the entire perimeter of the panel. Cut a relief notch in the flange of the piping to help it curve around the corners. 9. When you get back to where your piping started, let the piping overlap itself by a few inches and then cut off the excess. 10. Use your scissors to carefully snip the stitching out of the piping flange on one side. 11. Fold back the fabric so the piping cord is exposed and lay the cord next to the covered, pinned piping. 12. Cut the exposed piping cord so it lines up exactly with the other end of the piping. 13. Fold the remaining fabric at an angle and then lay the other end of the piping on top of it so the cording ends are meeting. 14. Fold the angled fabric over the top of where the cording meets and pin it in place. Now you’ll have a clean junction point where the piping ends. 15. With your piping or zipper foot still on your sewing machine, sew right next to the piping cord all around the perimeter of your fabric panel, starting just before the piping junction. 16. Now you should have two panels, one with piping and one without. 17. Lay your panels on top of each other again so the right sides are facing each other and the patterns are lined up symmetrically. The cording should now be sandwiched between the panels. 18. Sew around three sides of the assembly, close to the piping cord, but being sure not to sew over it. Leave an opening on the bottom edge of the pillow that’s about as wide as your hand. This is where we will insert the stuffing. 19. Trim the excess fabric out of the corners. 20. Turn the pillow outside right, being sure to poke out all of the corners so they can get filled. 21. Start stuffing your pillow. We cut open our old pillow to reuse the stuffing, but you can use new polyester fiberfill for stuffing, too. 22. When it’s good and puffy, fold under the raw, open edge and pin it in place. 23. 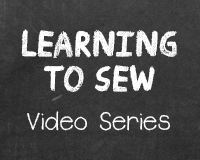 Using a curved needle, sew a slip stitch to secure the pinned edge. To sew a slip stitch, start by going through the underside of one side of your fabric with your needle and thread. This hides your knot on your thread. Then go back and forth running your needle through a bit of the fabric on the right and then the left sides. 24. Now your pillow is finished! All of the materials needed to sew your own lumbar pillow for your home or patio are available at Sailrite.com. Where would you put a lumbar pillow like this, on a patio chair or on your bed? Other ideas? Share your ideas in the comments. All Sunbrella fabrics are treated with a fluorocarbon finish that makes them water-resistant, but after years of being out in the elements and being pelted by rain the finish can wear off. If you notice that your Sunbrella fabrics aren’t beading water like they used to, it’s probably time to retreat them and restore their water repellency. We’ll show you what to use and how to retreat your fabric so it repels water again. To restore the water repellency of your Sunbrella fabric we recommend using 303 Fabric Guard. Actually, 303 Fabric Guard is also the choice of the manufacturers of Sunbrella as the best treatment to restore water repellency. 303 Fabric Guard also protects against stains and provides UV screening without affecting the color, feel or breathability of the fabric. While 303 is great for canvas like Sunbrella, it should not be used on vinyl, zippers, plastics, rubber, fiberglass or imitation suede, so be careful when applying it to canvas near these other materials. How do you know when to retreat your Sunbrella? We recommend always retreating your fabric after a thorough cleaning and also when you notice the fabric stops beading water. Do a quick test of your cover every couple of months by flicking a small amount of water on the cover and see if the water beads up and runs off or soaks into the material. If the water soaks in, it’s time to retreat. In this video we’ll show you step-by-step how to retreat a boat cover with 303 Fabric Guard. Also included is a brief discussion of the differences between the different lines of Sunbrella fabric and how to tell which side should face out on your projects (hint: for most Sunbrella fabrics, it doesn’t matter!). You can find 303 Fabric Guard and other products for cleaning and caring for your fabrics at Sailrite.com. Do you use 303 Fabric Guard on your Sunbrella fabric? Share your experiences with it in the comments. With spring right around the corner, it’s time to start thinking ahead to warmer weather and outdoor living spaces. If your outdoor furniture is looking sun bleached and tired, you can sew up new cushions and pillows before the season begins. This month we’re going to share two different patio projects to help you get ready for warmer weather. The cushions on this patio set were looking faded and worn from years of use, but the chairs were still in great shape. We gave the cushions a colorful makeover with teal Sunbrella Upholstery fabric. We also recovered the pillows with a coordinating fabric, and that tutorial will be out later this month. The cushions on these chairs feature a bullnose shape, or a rounded front. We’ve made bullnose cushions from scratch before, but the shape of this chair’s base made this assembly a little different. We’ve broken down the process step-by-step so you can recover your own bullnose chair cushions. Measure each panel of the cushion. Note the width and height of one side, the overall width and the height around both sides. The bullnose at the front makes the height all one panel. Cut out all of your panel pieces. You’ll need two side pieces, one main panel, and pieces for a back zipper plaque. Our side panels were 19.5” long by 4” wide, so we cut them to 20.5” x 5”. Our main panel cut measured 23.5” wide by 44” long. Our zipper plaque is 6” wide by 23” long. Take the two side panels and lay them on top of each other so the right sides are facing. Then fold the two panels over widthwise. Draw a slight curve at one corner and cut it out with scissors. This will create the front curve for the bullnose. Make matching bias piping. Follow our bias piping video tutorial for this step. Start pinning your bias piping to the right side of one of your side panel pieces. Cut relief notches in the piping’s flange to help the piping curve smoothly around the front of the side panel. At the back of the panel, let the piping overlap itself by a few inches and then cut off the excess piping. Use scissors to open the stitching in the piping cover on the free end to expose the cord. Lay the exposed cord next to the pinning piping and cut the exposed cord so it lines up exactly with the other end of the piping. Fold the remaining fabric at an angle and then lay the other end of the piping on top of it so the cording ends are meeting. Fold the angled fabric over to create a clean piping junction and pin in place. Repeat this process to attach the piping to the other side panel. Using a piping foot or a zipper foot on your sewing machine, sew the piping cord in place on the side panel. Next, make the zipper plaque. Cut your 6” x 23” zipper plaque piece is half so you have two 3” by 23” pieces. On one side of each piece, fold over a 1/2” hem and pin or baste in place. Take one side of your zipper plaque fabric and pin it in place along the zipper tape. The folded edge should cover half of the zipper teeth. Cut your zipper to match the length of your fabric if necessary. Using a zipper foot on your sewing machine, sew the fabric in place along the zipper flange. Repeat the process on the opposite side of the zipper. To assemble the cushion, start by attaching the side panels. Take the main cushion panel and fold it in half to find the center location on each side. Make a small snip with your scissors to mark these locations. Then, take the side panels and fold them in half widthwise to find their center points. Make a small snip to mark this location. Match up these center locations and start pinning the side panel and the main panel pieces together. Cut relief notches in the main panel if necessary so it will smoothly curve around the side pieces. Take the assembly to your sewing machine and sew the side panels in place. Find the center position on each side of the back of the cushion. Match up the zipper plaque with these center locations. Pin the zipper plaque in place along one side. Cut two small scraps of fabric and fold them in half. Pin these fabric pieces in place on either end of the zipper to create a stop. Be sure your zipper slider is in place before sewing the zipper on. Sew the zipper onto the rest of the assembly. Start sewing at the short ends and then move to the long edges. Pull the zipper teeth open with your fingers so the zipper is completely open. Turn your cushion over right side out. We cut open our old cushion and reused the foam that was inside. If you’re starting from scratch, you can use polyurethane foam or Poly-Fil Nu Foam for your cushion insert. We wanted to make our new cushion fuller than the previous, so we wrapped our existing foam in new polyester batting. We just wrapped the batting around the cushion like a book jacket on three sides and cut off the excess batting. Carefully insert your batting wrapped foam into the new cushion cover. Smooth out the filling and zip up the cover. Now you’re finished! Enjoy your bright new patio cushions! All of the materials needed to recover or make your own patio cushions are available at Sailrite.com. Stay tuned for the full step-by-step tutorial on making the coordinating lumbar pillow with piping as seen in the photos!